Drawing on her long experience letterpress printing on fine papers from all over the world, Julie has collaborated with skilled paper makers to design a superior artisanal paper for our wedding invitations. We use 100% cotton pulp, for incomparable softness and strength, pressed against specially woven wool felts for an elegant and refined natural texture. 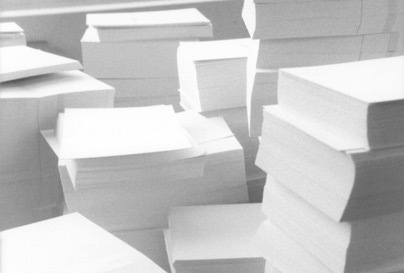 Our paper is mould-made in a single very thick layer, rather than laminated from thinner sheets, so it's not compressed and hardened like most heavy papers. We make our own double thick paper, pasting it by hand in our shop with a non-toxic, non-aerosol glue. Tree-free Holcomb Letterpress 100% Cotton brings a particular warmth and incomparable beauty to the distinctive texture of letterpress printing.